Some years ago, Gerald Berthold from Chemnitz already supposed that halo activity is subject to certain periodical changes. The reason for these apparently periodical changes puzzled him for a long time. Solar activity could soon be excluded because the periods of halo and solar activity have nothing in common. At first sight, some of the direct consequences of the NAO seem to be relatively clearly comprehensible. For example, when there is a high NAO index, the temperature of the surface water south of Greenland is significantly lower. Here the Iceland low seems to generate northerly winds which considerably lower the temperature of the water by arctic air from Greenland in the Labrador Sea. The convection (the sinking of water into the deep) becomes slower by this, and less warm water follows from the Mexican Gulf region. So the result would be lower temperatures in Central Europe. On the other hand, when the NAO index is high, water temperatures in the Bay of Biscay, North Sea and Baltic Sea rise. Is there a high difference in air pressure between Lisbon and Reykjavik, air currents from west to east are especially strong, which brings warmer and more humid air from subtropical regions to Central Europe. One could think that these are ideal preconditions for the formation of cirrus clouds and halos. But even under these weather conditions halo activity is especially low. And so here the questions begin. Are there better halos at low differences in air pressure because the cirrus clouds of the lows can pass high above without being hindered? Or do even small lows generate ice crystals with better optical properties? And under what conditions do the different ice crystals form? 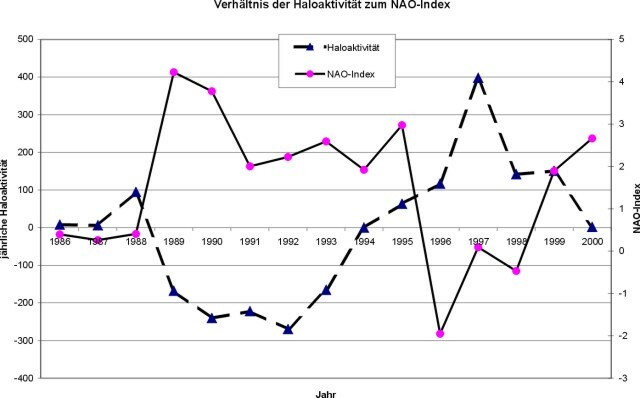 Can halos be forecasted from the NAO-forecasts? There is surely still a lot to be discovered in this area and perhaps the theory mentioned above will be an instigation for the meteorologists among us to attend to the questions.